Based on questions I have answered over the years, I decided to put together this list of important Springsteen-related sites in New York City. You could do this in a couple of hours. You also don’t have to do all of them. These are the top highlights I can think of as well as things I have been asked about over the years. Walk. Don’t take taxis. Walk or take the subway. There is no better way to understand New York City than to walk the streets. Listed in approximate North to South order. 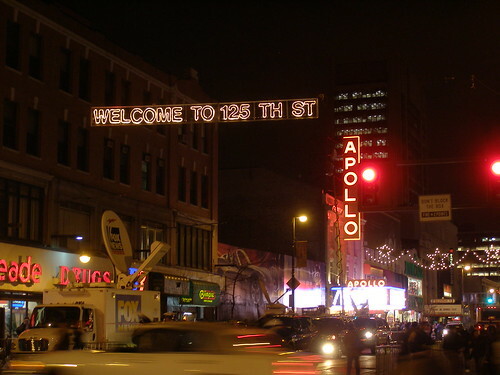 Apollo Theater: 253 W. 125th Street. offers tours by appointment. 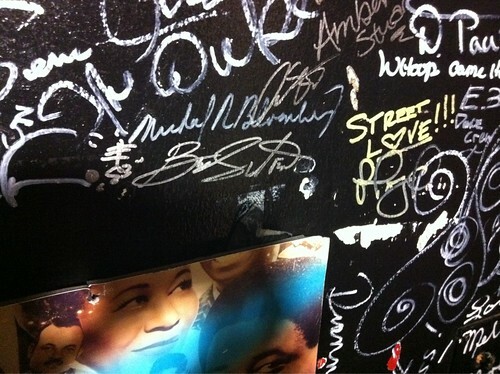 If you go, be sure to see Bruce’s signature on the backstage wall. Go stand in the dressing rooms and get goosebumps when you think about everyone who ever stood there. Saturday Night Live / Studio 8H as well as Late Night with Jimmy Fallon / Studio 6B: 30 Rockefeller Plaza, which is between 48th & 49th Street between 5th & 6th Avenue. There are studio tours and sometimes it’s easy to get tickets to Fallon by just showing up. I enter the SNL lottery every year and never win. Madison Square Garden: the entire block between 7th & 8th Avenues between 32nd & 33rd Street. They offered tours in the past but have stopped due to current construction. You can’t see the arena from 7th Avenue, walk around the whole block to get a sense of things. Max’s Kansas City: 213 Park Ave South: It’s now a residential building with a commercial space on the ground floor. There used to be some photos of the outside of Max’s in the vestibule of the building but the last time I walked by they were gone. The Palladium: South side of 14th St between Irving Place & Third Ave. Now a NYU dorm called “Palladium Dormitories.” Nothing left of one of the best theaters for rock and roll that I’ve ever seen. The cover of the Clash’s London Calling was taken at a show at the Palladium. Cafe Wha? : 115 MacDougal St. Still a working club. Kenny’s Castaways: 157 Bleecker St. Still a working club, but closing September 30th. Gerdes’ Folk City: 130 W. 3rd Street, now closed. Record Plant – gone, nothing to see. Hit Factory – now apartments called The Hit Factory condos. Not much to see. 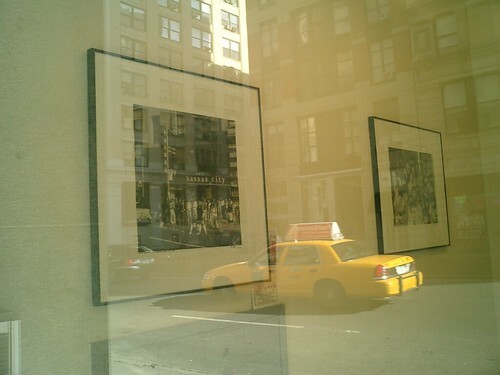 CBS Records: 51 W. 52nd St. (corner of 6th Avenue). If you don’t already know, most of Manhattan is a grid. So you can just pull out a map if you need to visit 82nd St., 57th Street or Broadway. Bleecker St. is the only off-grid street, but if you’re headed down to Greenwich Village you’ll find it easily. The Ed Sullivan Theater: Broadway between 53rd & 54th St. 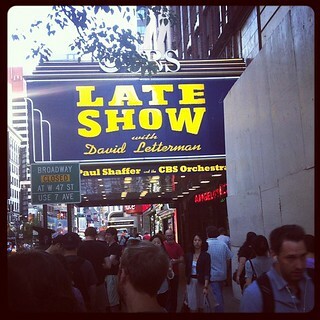 Famous for the Beatles debut, famous for Ed Sullivan, famous now for David Letterman’s show. You can apply for tickets in advance, but they also do hand out a lot of tickets the day of the show. More information here. Fillmore East: 105 Second Ave. It’s a bank now, nothing to see. Joey Ramone Place: the corner of 2nd and Bowery. The street sign is the most stolen one in New York City so it’s all the way up at the top of the pole. If you have a meal at Peel’s on the corner (recommended), ask to sit upstairs and you’ll have a good view of the sign. They have a Joey Ramone cocktail, too. Former home of CBGB at 315 Bowery: I have nothing good to say about the clothing store occupying the former location of CBGB’s and have to walk on the other side of the street because otherwise I make rude gestures at it. Chelsea Hotel: 222 W. 23rd St. The list of musicians and artists who have lived at this address is endless. Go see it now before they ruin it forever. Physical Graffiti building: 96-98 St. Marks Place. Have a great time. Don’t walk five people across, don’t stop suddenly while walking down the sidewalk, and you don’t ask cab drivers if they’ll take you somewhere, you get in and tell them where you are going. Note: This isn’t meant to be “A Guide To Every Place Bruce Springsteen Took A Photo In New York City”. Everyone will have that one photo they want to find the location of or try to recreate (for example, I tried to find the store in “Blood Brothers” numerous times, but it’s obviously long gone.). But I couldn’t possibly track all of them. There are many other great web sites that talk about the rock and roll history of New York City and I hope you use them, too. p.s. 10th Avenue is NOT the NYC one! Before it was the Palladium, the Palladium was the Academy of Music, where many bands played; I saw an oldies show before it closed. I got to Max’s a couple of times after the glory days. I think the chickpeas I ate there have finally digested. The Bottom Line. I can’t remember who I saw at the Bottom Line. The Bottom Line is where I learned to clear out space for myself by smoking a cigar. This trick may no longer work. Also I don’t smoke cigars anymore. CBGB’s was also past its best days: the one time I remember going (for John Cale. I think), it was made very clear that standing room without oxygen was going to mess with respiration and remaining vertical. And I’m trying to remember who told me about sneaking into the Fillmore East.